Katy Perry moves East Coast! It might be to be closer to her mother in law, as hubby Russel hails from good old UK, or maybe it is just to be where some of the other action is. 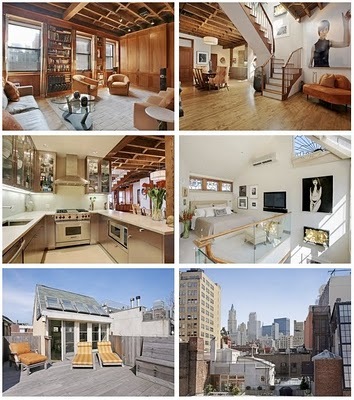 Katy Perry bought a modest sized anything but modest prices apartment in NYC. The newlyweds are the happy reported owners of 1,500 square feet, 2 bedrooms, 2 bathrooms in New York’s SoHo district. If you’re thinking she’ll be singing “East Coast represent, now put your hands up!” you’re wrong. Mrs Perry (or is it Brand now?) stays true to her roots. Just last year she and then still live-in boyfriend Russel splashed out $3,250,000 for a -not sure what country but surely mediterranean style – mansion in the trendy LA hood Los Feliz. Cause you could travel the wo-orld, but nothing comes close to the Golden Coast. This entry was posted in Famous buildings and movie locations, Homes of the rich and famous, See how others live and tagged Home of the stars, house, Katy Perry, Katy Perry's home, Los Feliz Home, Real Estalker, Russel Brand's home. Bookmark the permalink.